Seated: R. W. Bruce K. Pratt, Senior Grand Warden; Grand Master Fred Kirby Bauer; M. W. Fred K. Bauer, Grand Master; R. W. Richard W. Burgess, Deputy Grand Master. Standing: R. W. Donald W. Gillis, Jr., Junior Grand Warden; R. W. Christopher W. Huntoon, Grand Treasurer; R. W. Paul W. Rolston, Grand Secretary. 2000-33: Greetings to, and appointment of, Grand Representatives. 2000-37: Report of the Committee on Records. 2000-78: Greetings to, and appointment of, Grand Representatives. 2000-78: Recognition of the Grand Lodges of Acre, Brazil; Croatia; Paraiba, Brazil; Bulgaria; Sinaloa, Mexico; and Mali. 2000-80: Report of the Committee on Records. 2000-103: Greetings to, and appointment of, Grand Representatives. 2000-107: Budget for 2001 (motion only). 2000-132: Greetings to, and appointment of, Grand Representatives. 2000-135: Re-election of Grand Master Fred K. Bauer. Election of other Grand Lodge officers. 2000-136: Report of the Committee on Records. Visits by other Grand Lodge officers begin on Page 2000-161. 06/14: 2000-77; All proposals failed to meet the two-thirds requirement. 03/08: 2000-39; Freemasonry, A Link to the Twenty-First Century; opening remarks; trip to Panama; CHIP; internet information; discipline; One-Day Class; Masonic Home; visitations; conclusion. 06/14: 2000-82; Community activities; trip to England and Scotland; Masonic Home; Shrine membership proposals; scholarship; discipline; Grand Master's Fair; conclusion. 09/13: 2000-108; Call to Labor! ; Shrine; CHIP; Masonic Home; Supreme Council cornerstone; One-Day Class; conclusion. 12/13: 2000-140; opening remarks; Relief Funds ruling; Torah dedication; Masonic Home; cruise; internet; discipline; visits; One-Day Class; membership; appreciation; Education; Service; Library; insurance; scholarship; visits; medals. Amendments: Alpha, Fidelity, Major General Henry Knox, Milton, Rabboni, Richard C. MacLaurin, Rose of Sharon, Satucket, Social Harmony, Somerville; approved. Amendments: Blue Hill, Cawnacome Sunshine, Frank W. Thompson, Golden Fleece, Longmeadow, Satuit, Tahattawan, Wamesit, Wisdom, Wollaston; approved. Amendments: Bethlehem, The DeMolay, John Hancock, North Reading; approved. Amendments: Ancient York, Charles C. Spellman, Evening Star, Matthew John Whittall, Mount Horeb (Dennis), Old Colony, St. Paul (Ayer), Satucket; approved. 03/08: 2000-33; Rt. Wor. George Nathan Morris, Past District Deputy Grand Master. 03/08: 2000-34; Rt. Wor. Philip M. Turner, Past Junior Grand Warden. 03/08: 2000-34; Rt. Wor. Norman Wesley Whitcomb, Jr., Past District Deputy Grand Master. 06/14: 2000-79; Rt. Wor. Charles D. Batchelder, Jr., Past Senior Grand Warden. 06/14: 2000-79; Rt. Wor. Leslie Whittaker Bissett, Past District Deputy Grand Master. 06/14: 2000-80; Rt. Wor. Albert Frank Fitzpatrick, Past District Deputy Grand Master. 06/14: 2000-80; Rt. Wor. Malcolm Douglas Leonard, Past District Deputy Grand Master. 06/14: 2000-80; Rt. Wor. Frank Harlowe McDewell, Jr., Past District Deputy Grand Master. 09/13: 2000-104; Rt. Wor. Armond Joseph LaBelle, Jr., Past District Deputy Grand Master. 09/13: 2000-104; Rt. Wor. Philip Michael McCaffrey, Past District Deputy Grand Master. 09/13: 2000-104; Rt. Wor. Frederick Andrew Wood, Past District Deputy Grand Master. 09/13: 2000-105; Rt. Wor. Theodore Robert Sherpey, Past District Deputy Grand Master. 09/13: 2000-105; Rt. Wor. Stephen William Latham, Past District Deputy Grand Master, Past Grand Deacon. 12/13: 2000-133; Rt. Wor. Donald Wallace Gillis, Jr., Junior Grand Warden. 12/13: 2000-133; Rt. Wor. Albert Sheafe, Past District Deputy Grand Master. 03/08: 2000-34; Rt. Wor. Philip Mason Turner, Past Junior Grand Warden; presented by Most Wor. David W. Lovering, for the committee. 09/13: 2000-105; Rt. Wor. Charles Dana Batchelder, Jr., Past Senior Grand Warden; presented by Rt. Wor. W. Terence Stephens, for the committee. 12/13: 2000-134; Rt. Wor. Donald Wallace Gillis, Jr., Junior Grand Warden; presented by Rt. Wor. Warren R. Davis, for the committee. 12/13: 2000-137. Petition by Damascus and Mount Carmel, as Mount Carmel; granted. 01/22: 2000-11. Vista Hermosa, Panama. Visit to District Grand Lodge and Hall Dedication. 2000-12: Grand Lodge opened and received Most Wor. Dennis Allen-Frias, Grand Master of Panama. 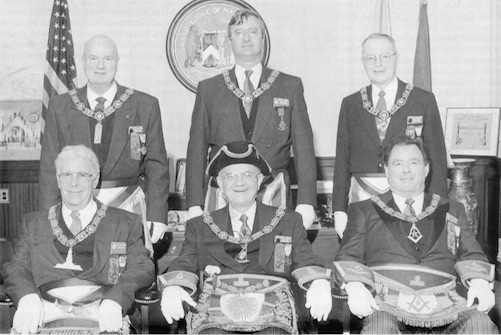 2000-12: Installation of District Grand Lodge officers. 2000-12: Presentations, including a Henry Price Medal to District Grand Master Jack R. Tutzauer. 2000-13: Dedication of the District Grand Lodge Masonic Hall. 01/24: 2000-15. Vista Hermosa, Panama. Joint visit to Sojourners, Ancon and Gatun Lodges. 2000-15: Grand Lodge opened and was received by Wor. George F. Klein, Master of Sojourners Lodge. 2000-16: Remarks by the Grand Master and other Brothers. 01/26: 2000-17. Panama City, Panama. Visit to the Grand Lodge of Panama. 2000-18: Reception of Grand Lodge by the Grand Lodge of Panama. 2000-18: Remarks by the Grand Master of Panama, Grand Master Bauer, and other Brothes. 03/11: 2000-45. Boston. Grand Master's One-Day Class. 2000-45: Grand Lodge opened on the First Degree. 2000-46: Conferral of the degrees by the Grand Lecturers and degree teams. 2000-46: Remarks by the Grand Master. 04/01: 2000-47. Barre. 200th Anniversary of Mount Zion Lodge. 2000-47: Grand Lodge opened at the Colebrook Country Club and was received by the Brethren and guests of Mount Zion Lodge. 2000-48: Presentations and remarks; proclamations from state government. 2000-48ff: History of Mount Zion Lodge, 1800-2000, by Wor. Walter E. Flister. 04/15: 2000-53. Boston. 75th Anniversary of Everett C. Benton Lodge. 2000-54: Grand Lodge opened and was received by the Brethren of Everett C. Benton Lodge. 2000-54: Remarks by the Grand Master and other Brothers. 2000-55ff: History of Everett C. Benton Lodge, by Wor. Franklin E. Kartun. 04/22: 2000-57. Watertown. Visit to Pequossette Lodge. 2000-58: Grand Lodge opened and was received by the Brethren of Pequossette Lodge. 2000-58: Presentations to Bro. Alexander S. Kananovich (50-year Medal) and Bro. Neil Edward Tillotson (80 year membership). 2000-59: Dedication of a room to honor Bro. Burton E. Hunt. 04/25: 2000-61. Auburn. Rededication of Lodge Hall. 2000-62: Grand Lodge opened and was received by the Brethren of Joel H. Prouty Lodge. 2000-62: Dedication of the Lodge building "in accordance with ancient usages." 06/25: 2000-87. Charlton. Dedication of stained glass window. 2000-88: Grand Lodge opened at the Masonic Home. 2000-88: Church service; dedication of the Aleppo Temple stained glass window "in accordance with ancient usage." 2000-88: Remarks by the Grand Master. 07/29: 2000-91. Lexington. Cornerstone laying at Supreme Council Headquarters. 2000-92: Grand Lodge opened at the new Supreme Council Headquarters and proceeded to the outside of the building. 2000-92: Cornerstone ceremony by the Grand Master, with representatives of the fourteen other Grand Jurisdictions. 2000-93: Remarks by the Sovereign Grand Commander and the Grand Master. 10/29: 2000-113. Charlton. Dedication of Torah Scroll. 2000-114: Grand Lodge opened at the Masonic Home. 2000-114: Dedication of the Torah Scoll "in accordance with ancient Masonic usages." 2000-114: Remarks by the Grand Master and other Brothers. 2000-165: Opening and roll call. 2000-172: Reception of guests, including Grand Representatives. 2000-173: Report of Grand Secretary; 674 diplomas issued. List of lodges not represented in Grand Lodge in 2000, as well as the past 2 years. 2000-174: Installation of Grand Master Fred Kirby Bauer. Installation of other Grand Officers. 2000-177: Deputy Grand Master Eugene B. Nichols. 2000-179: Most Wor. J. Philip Berquist, Past Grand Master. There were 45 districts in Massachusetts in 2000 (numbered 1 through 33), as well as districts for Chile, China, the Caribbean and Panama. This page was last modified on 23 September 2016, at 07:32.